Hi friends! My English Lessons column for Verve magazine has a new post up for February. Today Butter, Tomorrow World Peace touches on the way that dairy-making made me feel I could take on anything. Really. It honestly did. And does. You can read the post here. I'd love to know if taking on some sort of food-related project empowered you, too. Funny, the things that empower us. For some, it's Tae Kwon Do or getting inked or running a marathon. For me, it's making yogurt. Our little homestead is featured in the new issue of Anthology magazine! Editor Anh-Minh Le writes so beautifully about our place and what we're up to out here in her piece titled Home Grown. I'm so excited by this, as I just adore the publication. Photographer Jen Siska visited us this past October for a fun-filled afternoon of photo-taking. I'm super pleased with what she came up with. Anthology is available domestically and internationally at these fine retailers, as well as online at Anthropologie and at West Elm stores. Check it out. You'll be so glad you did! Happy Friday friends! Hope your week has gone well. Ours has been characterized by unusually warm weather and a sniffling, sneezing, coughing baby. We've been making the most of the balmy days, taking walks down the driveway to the creek that runs alongside our driveway's entrance and opening up windows in the house during the day (in JANUARY! It boggles the mind...). As for Huxley, I've been giving him this herbal children's tincture mixed with this cough syrup. I've combined those things with hot showers with me during the day (during which I shake some of this along the shower walls for inhalation purposes) and steamy baths at night, after which I rub a little combination of lotion and this balm on his chest and back. Coupled with loads of nasal bulb intervention on his tiny nostrils, it all seems to be helping. I'm also excited to try out this essential oil blend that Katie sent. It smells AMAZING! *Totally smitten with Camille's rural northwestern Oregon off-grid homestead. *Forest gardening has completely captivated me. *Waste wood into recycled furniture! *The future of food is a radical one. *Finally, a way to recycle old gift and credit cards! *Picked up a box of these biodegradable trash bags (I'll give a progress report soon). *Lisa's farm photos are exquisite. *A thrifty, low-fi means of creating mini-greenhouses outdoors (thanks to Meri for the link!). The weekend forecast looks pretty nice, so I'm imagining more walks are in store. I'm also plowing my way through a mountain of kumquats, Key limes and Meyer lemons my sisters brought during their recent visit. Nine half-pint jars of my Kumquat 5-Spice Marmalade are done, with many more to come. I think I'll make some of my Meyer Lemon & Lemon Verbena Curd next (both recipes can be found in my book). *I can't get over these constellation jammies Huxley has been sporting. They glow in the dark, lighting up our bed at night like a tiny map of the universe (albeit one punctuated with starry guitars and elephants!). They're insanely cute and fit really nicely. I highly recommend them, should you encounter a pair (although it looks like only size 3-6 months is available). I didn't really need another reason to love Larry's Beans. A coffee roaster across the state in Raleigh, Larry's already has so much going on for their beans and their business. They use organic, shade-grown beans (which is better for birds and bugs), they engage in fair-trade practices (wherein people are treated like, well, people, and not commodities), they heat their building with solar panels and they slow-roast their beans in a passive solar, rainwater-harvesting warehouse. Sounds good, right? And now, to really up the ante, their coffee bags are biodegradable. This means a lot to me. Typically, I try to reuse the same coffee bag every time I need more joe. After a while, though, the bag starts to fall apart. I'll then rip it up, add it to the compost pile, and grab a new one the next time I'm picking up bulk beans. On occasion, though, I forget and leave the bag at home. When that happens, or sometimes if a specific blend that I really like is on sale, I buy a prepackaged bag of coffee. I recently found another local supplier I adored and wrote them on Twitter to find out if their bags are recyclable. Sadly, they aren't. With Larry's, though, I needn't worry, as the bag will break down on its own. I make a good deal of purchase choices based on the "end of life" cycle of a product. I'd like to be able to recycle, upcycle, repurpose, reuse or biodegrade something after I'm done using it. Business decisions like this one from Larry's make my purchase decisions so much easier. I was just outside, emptying items into the recycling station when I came across these beauties. Surrounded by what looked like a small village of daffodils about to burst, these two Hellebores are living proof that, no matter how dormant and inactive it may appear, the soil is always, always, always teeming with life and activity. I appreciate that reminder. Life never slows, not for any of us. It may get quieter at times than others, but it's always moving, always kinetic, always chugging along, right beneath the surface. You can feel it in your pulse or witness it in gorgeous blooms, planted long ago with the promise to appear right when you need them to. *LJ, of No Children No Cry, you're the winner of the Barnheart giveaway. I've had trouble for some reason leaving a comment on your blog, so shoot me an email with your mailing info. when you have a moment. Thanks! Huxley got some quality reading time in with his grandmother ("Gigi") and great-grandmother ("Nanny") yesterday. They typically come over every Sunday, when Hubs heads out for 4 hours (!!!) of board time with the local Scrabble club. As we were having friends over for brunch today, we switched things up and hung out yesterday. I can't even begin to tell you how much it makes my heart swell to have four generations of love together every week. It's a wonderful thing to behold. I'm super excited about these new Tattler lids Kristina gave me on Friday. Thanks, friend! While I adore canning, I've long lamented the FDA recommendation to use new canning lids for every batch. Thankfully, Tattler's lids can be used again and again. Have any of you used them? I'd love your feedback. I'm about to make some of my kumquat 5-spice marmalade and would like to give them a go. Happy Friday, friends! What weird weather this week has brought, right? Serious snow and ice have raged in the Pacific northwest while we've been inundated with spring-like rains here in the south. We even have daffodils peeking up here in the cove! My poor honeybees are all kinds of confused, out foraging on the warm days and stuck indoors on the rainy and cold ones. Fellow beekeepers, keep in mind that this might require some early-spring feedings from you. Even if you provided ample honey stores to get the winged beauties through winter, all of this warm weather might prompt them to consume it all and even stimulate the queen to begin early laying in late winter. Check your hives on a warm, clear day in late winter/early spring and feed accordingly. *This (oldie but goodie) article on extended nursing was really captivating. *This gardening book and this amazing everything preserving book will be mine (incidentally, Harriet was profiled in my Canning book!). *Stacy's raised bed idea is genius. *Aran's citrus grove photos are so lovely. *The new issue of Styled is gorgeous. *Wes Anderson is back (Francis McDormand! Bruce Willis! Edward Norton!)!!! *Goodbye dryer sheets, hello wool dryer balls. *It's National Cheese Lover's Day (I know a helpful book for making some of your own ;^) )!!! *Jessie's book is bound to be hilarious. *Tara's canning jar label solution is brilliant. Wherever you go this weekend, whatever you do, may it be grand. I'm off to meet a group of ladies this evening to chat about our shared interests in learning to hunt and fish. If you're similarly interested, join us at 6 p.m. at the French Broad Chocolate Lounge. We'll be the motley crew swilling wine and chowing down on salted caramels! While I can't recall exactly where it was that I first encountered Willi Galloway, I can tell you that I was instantly smitten. Positively radiating goodness, Willi's blog Diggin Food captivated me from the get-go. It's a digital cornucopia of organic growing and cooking tips and suggestions. And Willi should know. The former West Coast Editor of Organic Gardening magazine, she now pens the weekly column "The Gardener" on the green living section of Apartment Therapy, offers gardening advice every Tuesday morning on Seattle's NPR call-in show Greendays, teaches a joint gardening and cooking class with James Beard award-nominated chef Matthew Dillion at The Corson Building in Seattle, and (because, clearly, not near enough!) also hosts an , online garden-to-table cooking show, Grow. Cook. Eat., with her husband Jon from their Portland, Oregon home. 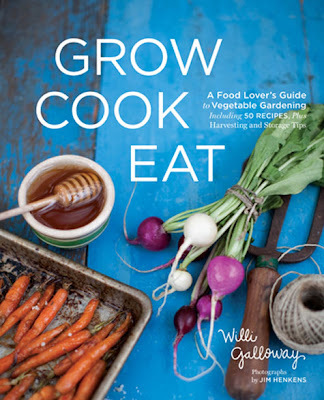 Fortunately for all of us, Willi has distilled that massive collection of knowledge into a wonderful new book, Grow. Cook. Eat.. Her publicist recently sent me a review copy and I can't recommend it enough. Not only is it lovely to behold, it's imminently practical to use and apply. This is the gardening book you absolutely want to have on hand this coming growing season. 1) What got you into growing and gardening? Were your parents gardeners, or is this a passion you cultivated yourself? I grew up in Wyoming, which is not the most hospitable place for a vegetable garden, but my mom had a huge garden when I was little (about 1/3 of our backyard). Some of my very earliest memories are being in the garden with my mom, picking strawberries, looking up at corn that was taller than I, and generally snacking on whatever I came across. English peas were and are still one of my very favorite things to eat right out in the garden. In high school I worked at a nursery, where my job every spring was to transplant thousands of tomato seedlings, and I worked on a ranch in college maintaining the perennial borders around the ranch house. 2) Do you have a favorite thing you grow? I'm especially fond of the ease of growing culinary herbs. My favorite things to grow are things that are really hard, if not impossible, to find at a regular grocery store. Especially pea shoots and squash blossoms and unusual varieties like 'Golden India' snow pea, which has these amazingly beautiful two toned purple flower and pale yellow pea pods and 'Purple Peacock' broccoli, which is a cross between kale and broccoli and produces yummy kale-like leaves and tons of tender broccoli side shoots. I also love to grow herbs, because adding fresh herbs is the easiest way to make a ho hum, regular dinner taste way better. I grow gobs of basil, because in my mind, you really cannot have too much of it. 3) For someone just getting interested in gardening, do you have any "beginner" crops to suggest to them, that typically grow easy in most climates? Cherry tomatoes are great because they grow fast, ripen up early, produce tons of fruit and grow well in containers or the ground. I also think planting lettuce seedlings is nice because you can harvest a homegrown head of lettuce in just about a month. And radishes are wonderful, because they sprout in just a few days and are ready to harvest in only 4 to 6 weeks. Plus, freshly pulled radishes are so crisp and flavorful, nothing like the hot, pity little balls that are so often found at grocery stores. 4) On the other hand, are there any crops you find to be particularly difficult to grow, that are worth the effort, but that gardeners should be prepared to handle challenges with? Big brassicas, especially cauliflower and broccoli, can be very finicky, especially in spring. But it is very satisfying to harvest them and a lot of people don't realize that their leaves are edible and very tasty. I think of them as a kind of a consolation prize if my cauliflower doesn't work out. You can use the broccoli and cauliflower greens just like collards. Melons are difficult in my cool Pacific Northwest climate. They require a lot of babying in order to produce fruit, but harvesting a homegrown melons is really one of the best simple pleasures. 5) I'm often perplexed when it comes to harvesting, finding myself wondering how best to remove pickings without harming the crop. Any suggestions for learning the best techniques for gentle harvesting? I find that a lot of people, even experienced gardeners, wait to harvest until the plant looks like it does in the grocery store. This is not a bad strategy at all, but you'll often miss out on other stages of harvest (i.e. beets can be harvested from marble size on up and their greens are very tasty at any stage) and other edible parts of the plant (like squash blossom or radish pods or kale flower buds). In my book I focused on trying to be very specific about what parts of the plant are edible, when the best times to harvest are, and the best way to harvest each of the edible parts. In general, if you tug on a fruit and it doesn't come off, use scissors to snip it off. I also keep old steak knives all around my garden. I slide the blade just under the soil line to harvest heads of lettuce, broccoli rabe, bok choy and I use the knives to sever individual kale, swiss chard and collard leaves from plants, as well as peppers and eggplants and big tomatoes. I buy the knives at estate sales and stab them into the soil at the edge of my beds. Because you, too, should have access to such a fantastic piece of literature, Willi's publisher, Sasquatch Books, has graciously offered one small measure reader a copy of Grow. Cook. Eat.. To be entered into the giveaway, simply leave a comment listing your favorite thing to grow, or something you'd like to grow in the future. For me, it's two things: mushrooms (outdoors) and citrus fruit (indoors). What about you? What dirt from what crop is itching to get under your green, growing thumb? The giveaway will run through next Wednesday, January 25th, midnight EST. Canadians, feel free to enter. Do be sure to leave a means of contacting you, should you be the winner, via either a link back to your own blog or website or with your email address in your comment. Winner or not, do give Willi's book and blog a look. She's got the golden touch when it comes to all things garden-related. 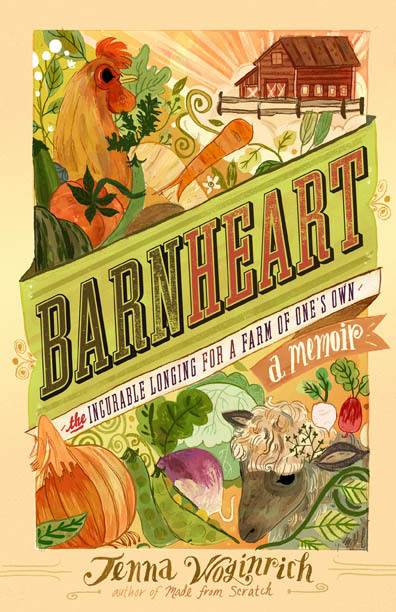 *Don't forget, there's still time to enter last week's giveaway for a copy of Jenna Woginrich's book Barnheart! UPDATE: The winner of Grow. Cook. Eat., as deemed by the Random Widget, is lucky #27. Liz C. I'll be getting in touch soon for your mailing information. Thank you so very much to everyone that entered. It looks like we're a happily growing bunch! Big thanks to Where Women Cook for profiling me on their blog Amuse Bouche today. Being a contributor to the book was so much fun (by the way, those are our grit cakes on the cover!). I can't wait until Huxley is big enough to show him the images and cook him up some of the recipes from that loving, fun-filled day! The Wall Street Journal has a post up today on making dairy products at home. Myself and my buddies A.J. and Claudia were all mentioned in it. I've put a partial excerpt of the article below (to read the entire piece, you'll need a subscription). A.J. 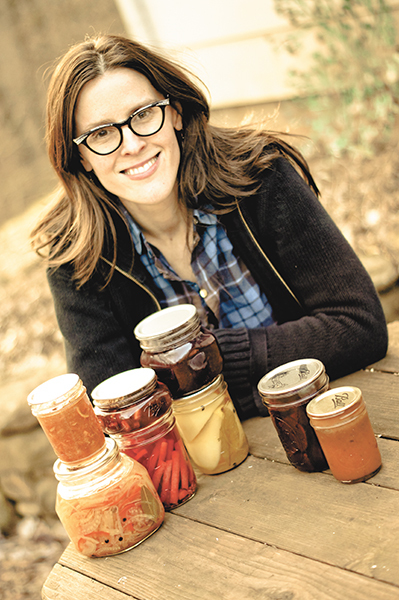 Simone, a 23-year-old account executive at a furniture chain, had tried pickling, canning and bread-making. The next frontier for him: making cheese. "The first time I pressed cheese into a pre-formed mold, it was really satisfying," says Mr. Simone, of Queens, N.Y. He now makes ricotta and dabbles in South Asian paneer. are in a profound state of awe," she says. To know me is to love, and accept, my abhorrence of waste. I'm constantly on the prowl for ways to reduce, or eliminate entirely, the amount of things we toss in the garbage. This means loads of recycling, making abundant use of Craigslist and Freecyle for unloading used goods, donating to thrift stores, and reusing and repurposing whenever it makes sense. Plastic bags are one item in my waste purging mission that drive me batty. We've completely removed any need for them at the grocery store, and frequently turn them down when shopping for household or personal items. That said, I find that I can't avoid them entirely. Many things I use and rely on come in plastic bags. So, while I can't get away from them completely, I can do something about them when they're in my possession. Things like the plastic bags that bedding for the chicken coop come in get emptied and recycled, while reusable storage bags, like those pictured above, get washed, rinsed, dried and used again and again (and again and again and again, to their death!!!). I'm stoked about the new wooden bag dryer we picked up recently. It's made locally by Branching Out Woodworks (we picked ours up at the Amazing Savings on South French Broad Ave.). Hubs gave it a coating of chocolate brown paint so it would blend in better with the laundry area where we placed it. He attached it to the wall yesterday (it comes unassembled; you secure the dowels with wood glue and then attach it wherever you want by driving the screws-which are provided-through pre-drilled pilot holes in the base). This dryer is a serious upgrade from my previous bag-drying set-up, which simply involved inverting bags onto the ends of the upright ironing board or over a large vase above the utility sink. Now I've got something both functional and attractive to look at. This bag lady couldn't be more thrilled! Just thought I'd post a quick reminder for all the local yokels that I'll be chatting up all things "Backyard Chickens" this coming Thursday at the AB-Tech campus. I think there's still a few spaces available. And, for those of you unable to attend a Thursday evening course, I'll be doing the whole shebang again on February 10th (a Friday) from 10 a.m.-12:30 p.m. at the Asheville Mall. Quite excited about the newest addition to our reading library. With 11+ acres to forage from out here, there's bound to be more wild edibles than those I already know of. Incidentally, I was thinking of perhaps doing a wild foraging walk on our property sometime this spring. 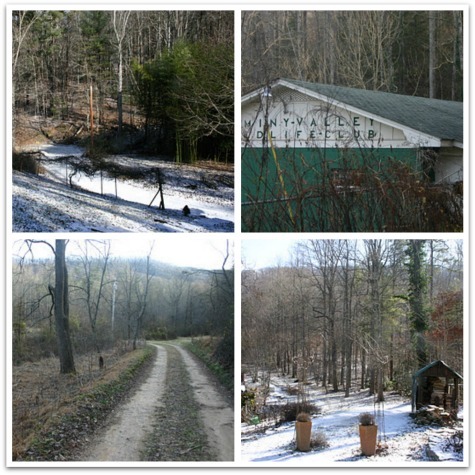 We'd tour the woods, searching for and discussing wild foods, then come back to the house for lunch. Would any local readers be interested? Happy Friday, friends! My sisters are visiting from Florida, so we've been doing lots of sisterly things, like playing Rummikub, chatting by the wood stove, sipping hard cider, and giggling, lots and lots of giggling (especially after watching this video-and this clip, too). Here's a smattering of this's and that's that tempted my tastebuds, dazzled my vision, and pleased my ears! *These dominoes are beautiful (via honey kennedy). *I made this the other day and you should, too (we used Honey Crisps instead of Grannies, tho). *Garden tools for the ladies!!! *Baker Creek's catalouge is exquisite. *Now this is my kind of garden shed. *Tree hotels (via 101 Cookbooks)!!! *Cards and calenders rendered from photos of tree bark. *Loving all the wood in this house (via Door Sixteen). *The sisters and I have been listening to this on repeat (this version, too). We're headed downtown in a bit, to nosh on ciders and burgers here and then get our chocolate fix here. After that, we're meeting friends for bowling. YES! Ever had something you long for? Something you pine for so deeply it aches? An itch you just can't seem to scratch, no matter how hard you try? My buddy Jenna had that particular affliction something fierce. She had a desire so strong, a yearning so profound that she called it a disease, seemingly without cure. "Barnheart" was what she had, and a farm of her own was what she wanted. In her new memoir, Jenna chronicles her journey of moving from one rental property in Idaho to another in a Vermont cabin. After a series of snafus left her yearning for a place of her own, she took an enormous leap of faith, secured a mortgage, and became the proud overseer of a stellar farm on 6 acres in Upstate New York. Barnheart bears witness to Jenna's processes of becoming a shepherd to a small herd of sheep, a handler to her very own sheep dog, a gardener dealing with the inevitable triumphs and travails befalling such a pursuit, and so much more. For about a week in December, I would curl up in bed with Huxley at night and, as he drifted off to sleep, savor a chapter or more in Barnheart. It's the sort of read you want to draw out and linger with, to mull over and ruminate on. To celebrate Barnheart, I'd like to give one fortunate small measure reader a copy of their own. To enter, simply tell me what your own longing is. What do you "hanker" for, as it's said here in the south? Me, I want an orchard on our property. Nothing massive, just a small orchard with a number of fruit and nut trees. I know we'll get there, eventually, but in the meantime, every time I walk or drive down by our lower field, I see my future orchard in my mind's eye and hanker for it. Big time. So, what about you? Leave a comment telling me what thing, or place, or person stirs pangs of longing within you. I'll leave the giveaway open for a week (I'm thinking that Wednesdays will be the new standard small measure giveaway day, a sort of "Humpday Giveaway", to move us all sanely through the week's remainder), concluding midnight EST January 18th. Canadians, pine away, your longings are welcome here, too. Please leave a means of contacting you in your reply should you be the winner, either via an email address or a link back to your own blog or website. Either way, winner or not, do check out Barnheart. Jenna has written a beautiful, sincere, heartening book, packed with inspiration. Whether you aspire to a farm of your own or not, her tale proves that whatever the heart wants, the heart wants and that, with perseverance, fortitude, courage, and sometimes a few tears, it can be had. UPDATE: The winner of the Barnheart giveaway is lucky number 131, LJ of No Children, No Cry. Thank you SO much for your enthusiastic replies. I loved reading everyone's comments. Keep pining, folks. You'll make your dreams happen that way! Hi friends! Happy Friday! We had a pretty great week, chez English, save for Wednesday night when Huxley poked his finger directly into my right eye and I thought a trip to the E.R. was imminent (oof!). Otherwise, this week was an especially fantastic one, as I got to view and edit the unbound copy of my new book. Oh, man. It far surpassed my expectations. You're going to love it. Details are coming, just as soon as I'm free to give them to you. *These images of the Ross Sea in the Antarctic are stunning. *I'm curious about Uncle Harry's products. Anyone familiar with them? *Lykke Li's new album is heaven. *A recipe for making Scandinavian-style room temperature yogurt. *I pretty much love every single one of Lady TA's dresses and skirts (and the prices! AMAZING!). *Love this tote from Anna. *New season of Portlandia begins tonight. YESSSSSS!!! *My lovely friend Faryn picked up this amazing all-natural scented modeling clay for Huxley! Whatever you do this weekend, wherever you go, may it be grand!!! Very excited with some new reading material that arrived in today's mail!